Persistence Market Research (PMR) delivers key insights on the global heart health supplements market in its upcoming outlook titled, “Heart Health Supplements Market: Global Industry Analysis 2013-2017 and Forecast 2018-2026”. In terms of value, the global heart health supplements market is projected to register a healthy CAGR of 8.2% during the forecast period due to various factors, regarding which PMR offers vital insights in detail. Nowadays, consumers have increased inclination towards the consumption of dietary supplements, which has created a robust growth in the recent years as a result of increasing disposable income in developing countries. With the growing working population, along with a rise in the prevalence of chronic diseases, consumers in Asia Pacific are willing to spend more for heart health supplements. Hence, this has resulted in the rapid growth of the heart health supplements market, and is expected to boost the market over the forecast period. Moreover, the lifestyle of the urban population is fast-paced as compared to that of the rural population. The urban population is more health conscious and aware of many new products available in market which provide various health benefits. This is a major factor for their inclination towards dietary supplements. According to the United Nations Department of Economic and Social Affairs (UN DESA), India and China recorded the largest rise in urban population in Asia in 2013. India is expected to have 404 million urban dwellers, while China is projected to be home to 292 million urban dwellers by 2050. Natural supplements which are plant- or animal-based are more beneficial nutrient dense supplements as compared to synthetic supplements. Natural supplements come from food-based sources, and as a result, the body will absorb more nutrients as compared to supplements that have artificial ingredients. There are many health benefits associated with natural supplements, which include weight loss, no obesity, natural cures, healthy lifestyle, and weight control. On the other hand, synthetic supplements are made from artificial chemicals and vitamins, which may cause harmful effects to health. Thus, with an increase in the awareness among the population about the health benefits of natural supplements, consumers are inclining towards natural, non-modified functional ingredient products, which is expected to surge the demand for the heart health supplements market during the forecast period. This report covers trends driving each segment and offers analysis and insights of the potential of the heart health supplements market in specific regions. Europe was the largest market for heart health supplements in 2017, accounting for 32.2% of the global market share, followed by North America and Asia Pacific with market share of 30.6% and 25.7% respectively. From 2018–2026 the Asia Pacific heart health supplements market is expected to grow at a CAGR 9.4%, driven by populous countries such as India and China. Consumer awareness about the benefits of dietary supplements, wide product availability, and development in retail and pharmacy supply chains are the major drivers for the market in the region. Under the form segment, soft gels/pills (the largest segment in 2017) increased by a CAGR of 7.6% during 2018–2026 to reach USD 13,170.3 Mn in 2026. Under the end user segment, men (the largest end user segment in 2017) increased by a CAGR of 8.3% during 2018–2026 to reach USD 11,360.3 Mn in 2026. 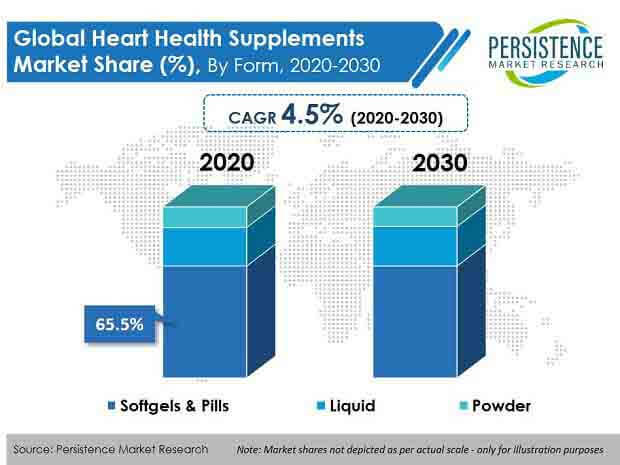 Under regional segment, Europe heart health supplements market (largest market in 2017) increased by 7.4% CAGR during 2018-2026 to reach USD 8,734.8 Mn in 2026.